The Octagonal Blender Machine manufactured by Abster Equipment is entirely suitable for the mixing of granular products. The Octagonal Blender machine also offers great flexibility of operations as well as easy cleaning and maintenance. Simple structure with GMP-compliant design further enhances the functionality of the machine. 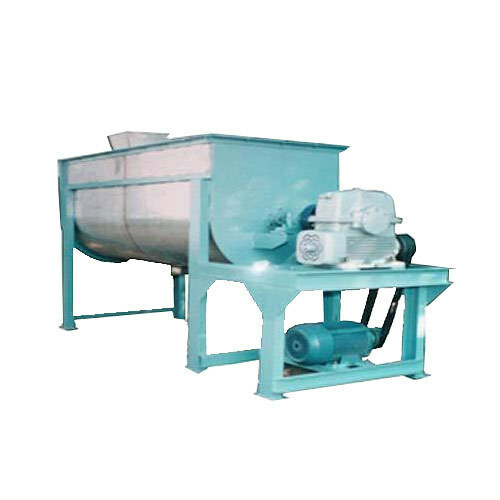 This Octagonal Blender Machine has been developed for mixing of various types of granular products. The Octagonal Blender machine is efficient and versatile used in mixing and lubrication processes in various industries. Some of the main industries of use include pharmaceutical production, food industries, chemical processing and also making of cosmetic products. Capacity 50 kg to 5000 kg. We are engaged in manufacturing a comprehensive range of Ribbon Blender that is manufactured utilizing mild steel and stainless steel sourced from reputed vendors. Our ribbon blenders are specially designed for efficient mixing of powders, pastes and liquids in both continuous and batch processing. The application specific rotor mixing element design allows shorter batch cycle times due to increased mixing efficiency. The outer blades push the material to the center of the container and simultaneously inner blades pushes the material to either ends of the container. 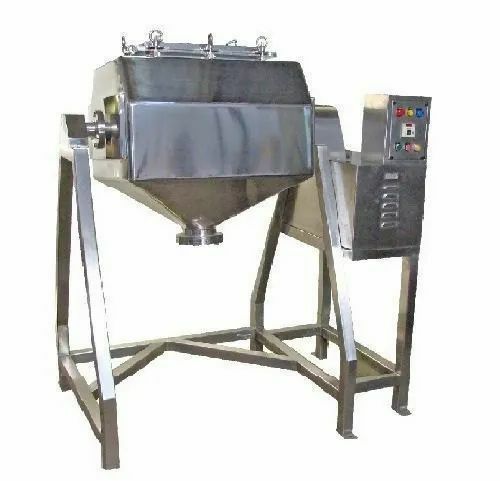 Moreover, the mixing vessels of the blenders are in standard U-shape or cylindrical and are provided with optional ASME Code designed jackets for heating or cooling applications. Conta Blenders"Abster" Conta Blending system has replaced completely the conventional blenders like 'V' shape / Double cone or Ribbon type. It is a latest cGMP concept with an emphasis on the dust free transfer of powders and granules at different stages from sizing / dispensing to compression / filing of Tablets or Capsules. Conta Blender has a flexibility of Batch Volume. Varying size of containers can be mounted on a drive console which is equipped which clamping cage. Batch size variation achievable in 500 Kg. Model for example, is from 75 Kg. to 500 Kg. using two different sizes of containers. The mixing efficiency is better than the other type of tumbling blenders like Double Cone, 'V' or Octa as they rotate in a diagonal and in a eccentric plane. It shuffles the product intimately resulting in homogeneous blend within 5-20 min. In granulation room, the dry granules enter to the IBC container for blending through a dust-free connection and the same IBC container is loaded over to the blender for blending. The IBC bin locked in the resting frame in 15° then lifted by hydraulic system in 15° inclined position after that the IBC bin rotates for blending with 3 dimension action. This same container after blending loaded over the tablet press for unloading in to the tablet press hoppers. 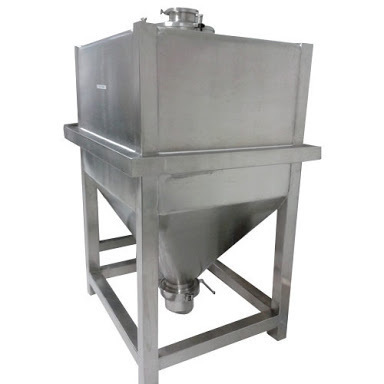 IBC Bin Blender for an Ideal dry mixer for lubrication of granules and homogenization mixing and conveying of the material to further process. Also, another advantage is adaptability of this system to handle more than one size of bunkers or containers so processing of different sizes of production batches in a single equipment. Hydraulic power pack system for a lifting of product bin for mixing. The charging hole with cover is provided on top with quick opening and closing arrangement with dust proof joints for particle-free transfer. 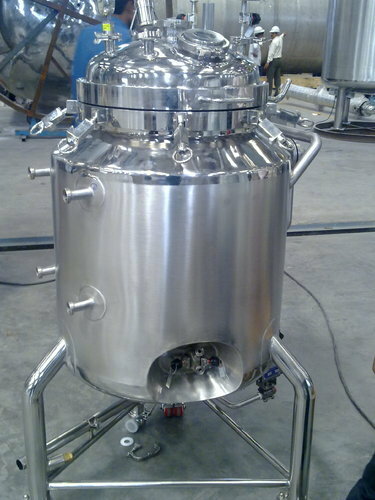 preparation Vessel is made as per WHO & USFDA standards to manufacture sterile solutions. This is a completely closed vessel with agitator mounted on top dome. This vessel available with different accessories for different applications i.e. standard stirrer/magnetic stirrer as required by the customers. All contact parts/surfaces made out of SS 316/SS 316L quality. The vessel will be jacketed, insulated and classed by SS 304 sheet.